Human Albumin in vitro ELISA (Enzyme-Linked Immunosorbent Assay) kit is designed for the quantitative measurement of albumin levels in urine, saliva, milk, cerebrospinal fluids and cell culture samples. An albumin specific antibody has been precoated onto 96-well plates and blocked. Standards or test samples are added to the wells and subsequently an albumin specific biotinylated detection antibody is added and then followed by washing with wash buffer. Avidin-Biotin-Peroxidase Complex is added and unbound conjugates are washed away with wash buffer. TMB is then used to visualize HRP enzymatic reaction. TMB is catalyzed by HRP to produce a blue color product that changes into yellow after adding acidic stop solution. The density of yellow coloration is directly proportional to the amount of albumin captured in plate. 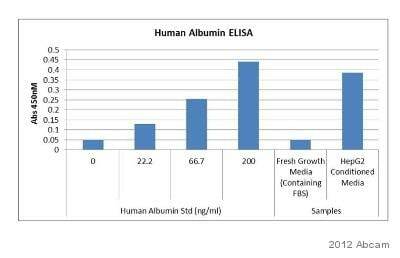 Get results in 90 minutes with Human Serum Albumin ELISA Kit (ab179887) from our SimpleStep ELISA® range. Please note: For both the 10X Diluent N Concentrate and 20X Wash Buffer Concentrate, please ensure to mix well by inversion before use to avoid precipitation. Our Abpromise guarantee covers the use of ab108788 in the following tested applications. Concentration of albumin from differently diluted (in parenthesis) samples, demonstrating a linearity of 84-90% in CSF and 88-111% in milk (duplicates; +/- SD). Albumin in HepG2 (diluted 1:50-200) and HeLa (undiluted) supernatants, heparin-treated plasma and serum (5e5-5e6), urine (100-500), milk (5000-30000), saliva (200-2000) was measured in duplicates (+/- SD). We are looking to run a total protein assay on milk samples that have been diluted to be ran on this kit as well. Can you tell me if the Diluent N has any components that would interfere with a standard protein assay? Thank you for your inquiry. 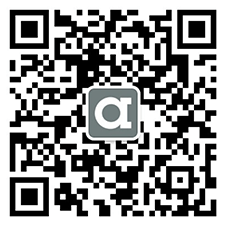 Ab108788 is validated for use with milk samples. The Diluent N does not contain BSA or casein but a BSA like protein. It does not interfere with human albumin measurement or cross react. Is it possible to purchase Nx1 thinner for use with ab10878? Yes, we added this diluent to our catalog: Diluent Concentrate (10x) ab172376. Although this kit has not been tested in cell or tissue lysates I want to test it with cells removed from the matrix. Are there any lysis buffers that I should avoid that may interfere with the kit? While this kit as not been tested with tissue or cell lysates, in general, a lysis buffer containg a low concentration of triton-X-100 or SP-40 (less than 1 %) will not affect the assay. I run an assay yesterday using the Albumin Human ELISA kit (ab108788). Unfortunately, it was saturated. Is it possible to order the antibodies separately, that way I can re-run the experiment? Additional Notes: Recognized human albumin. Did not recognize bovine albumin in FBS.